LONDON (AP) — As 2018 draws to a close, Europe is no closer to knowing the final outcome of Brexit, and Russia’s ties with the West show no sign of improving. 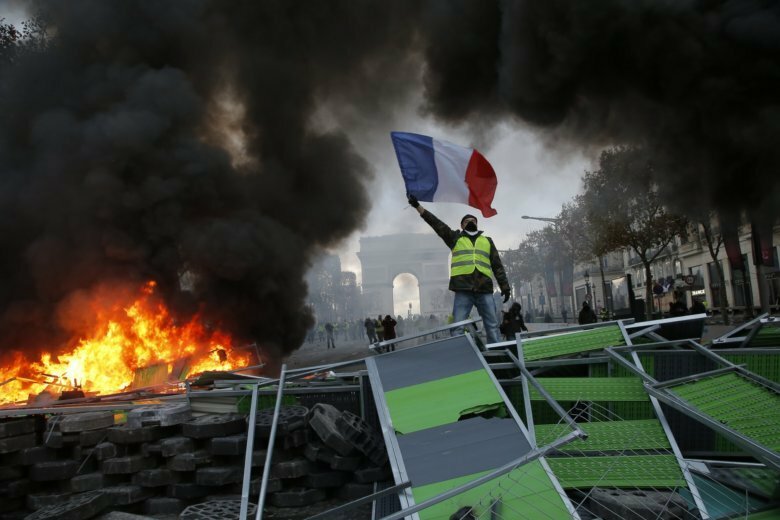 The streets of France have seen violent protests as “yellow vest” demonstrations have morphed from anger at a fuel tax hike to general discontent with French President Emmanuel Macron’s government. Protesters in Paris have torched cars, set fire to barricades and even vandalized one of the country’s most sacred monuments, the Arc de Triomphe, to demand more help for the country’s financially struggling families. The European Union and Britain reached a deal on Brexit, but British Prime Minister Theresa May’s government is under threat as many lawmakers have vowed to vote down the agreement in Parliament. London has seen anti-Brexit protests, with demonstrators dressed in colorful costumes calling for a second referendum on the question of Britain’s relationship with the EU. Officials in Britain and the EU, including European Commission President Jean-Claude Juncker, are looking at their watches as the clock ticks down to March 29, the day Britain is due to officially exit the bloc. May has tried to lift the spirits of her Conservative Party, even poking a bit of fun at herself by doing a robotic dance as she waltzed onstage at the Tory party conference in October. Previously, May’s dancing at an event in Africa drew ridicule in the media. The British royal family also gave the U.K. public a bit of respite from Brexit, with Prince Harry marrying American actress Meghan Markle in a ceremony at Windsor Castle. In Germany, Chancellor Angela Merkel announced that she wouldn’t be a candidate in the country’s next election, which is due in 2021 but could come earlier. Major political change reached Africa as well, with Zimbabweans voting in July in their first election without former President Robert Mugabe on the ballot. Europe witnessed another year of migrants making dangerous journeys across the Mediterranean to try to reach EU nations. Despite the fact that far fewer migrants arrived in 2018 than the previous year, aid workers have been stretched, scrambling to rescue asylum-seekers who often set out in unseaworthy boats run by smuggling gangs. But the images of rescue boats packed with exhausted migrants in orange life vests have done little to unite EU nations, with many arguing among themselves over which country should take them in. Russian President Vladimir Putin gave his annual state of the nation address in March, days before a nerve agent attack on a Russian ex-spy in Britain turned the West even more against Moscow. The Russian government, which denies any involvement in the nerve agent attack, went on to display its military might by hosting major military exercises in September that included China. In Italy, a bridge collapsed in Genoa during a sudden, violent storm in August, killing 43 people. It led to calls for safety checks of all major bridges around Italy.